the uterus. This tissue is known as the endometrium. that generally occurs once every 28 days in women who are not pregnant. WHERE IS ENDOMETRIOSIS USUALLY FOUND? blood that have a specific effect on tissues in the body. a thin layer of flexible tissue that covers something. uterus, they may form scars known as adhesions. WHAT ARE SIGNS AND SYMPTOMS OF ENDOMETRIOSIS? a bowel movement. Symptoms generally get worse over time. the condition or do not find out until they go to the doctor to discover why they cannot get pregnant. Endometriosis leads to increased rates of infertility, which is the inability to produce offspring. reason why the exact number is unknown is because many women do not have symptoms. endometrial tissue may attach itself to the structures discussed above. 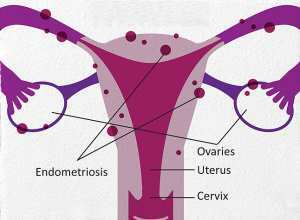 component to endometriosis, since the condition is more likely in women whose mothers also have it. to check for cancer cells. Fortunately, endometriosis is rarely cancerous. large single cut through the abdominal tissue. endometriosis by thinning the lining of the uterus. An example of a commonly used progestin is Provera. increase of GnRH overwhelms the body and causes the ovaries to shut down estrogen production. above also have potential serious side effects, so it is helpful to research treatment issues carefully. WHAT ELSE IS ENDOMETRIOSIS KNOWN AS? Endometriosis is also known as endometrial implants. WHAT IS THE ORIGIN OF THE TERM, ENDOMETRIOSIS? the words together and you have "within uterus turning condition."